As landscaping contractors in Springfield, MO, our horticulture services keep your trees, plants, flowers and shrubs in the sort of bursting good health that makes you proud every time you see them. 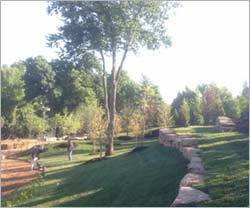 Because of our climate, landscape design in Springfield, MO, can include a lot of different plants, and living things need care. Even winter landscaping can look good here. We offer tree trimming, tree removal, transplanting, spraying and arborist services to keep your trees healthy and strong. Our lawn inspection and analysis services can help you identify soil problems or invasive grasses, and we can remove those pests and amend the soil for healthier lawns and gardens. We can monitor your ornamental trees, bushes and flower plantings for health and growth, and provide pruning, removal and surgery when these plantings need extra care.We offer lawn care and mowing for Springfield, MO and surrounding towns, as well. And when you're ready to add new plantings or change up the backyard or add more curb appeal with a new garden, of course we do that, too. landscaping needs. We offer various programs, such as weekly maintenance and seasonal clean-ups. Your lawn and garden health depends on proper maintenance--and we know you have more important things to do than spend your free hours on weeding, digging, spraying, and all the chores involved in maintaining your flowers and greenery. Let us do the work and you enjoy the results! We also provide complete lawn services: mowing, edging, blowing, fertilization, as well as irrigation repair. With proper care, your lawn will be the envy of the neighborhood -- a lush and green carpet. We create a plan to meet the specific needs of your new or existing landscape in order to keep it looking and performing its best, and serve both residential and commercial customers in Springfield and across Southwest Missouri. Whether you have a small or a large yard, we'll help you keep it looking spectacular.